General Curtis LeMay was a belligerent Cold Warrior who was portrayed in the satirical film Dr. Strangelove, as the trigger-happy General Jack D. Ripper. In air campaigns against Japan during World War II, LeMay abandoned the established policy of daylight, precision bombing. Instead, he loaded his B29's with firebombs and sent them out over Japanese cities during the night. As LeMay described it, the B29's "scorched, boiled and baked to death" some 330,000 people. After World War II, LeMay served in the Pentagon. In 1947, LeMay transferred to Wiesbaden, Germany to command U.S. Air Forces in Europe. LeMay returned to the U.S. in October 1948 to take charge of the Strategic Air Command (SAC). LeMay's first war plan, drawn up in 1949, proposed delivering "the entire stockpile of atomic bombs in a single massive attack" -- dropping 133 atomic bombs on 70 cities within 30 days. By the end of his term, the SAC was on constant alert and ready to execute an all-out atomic attack at a moments notice. 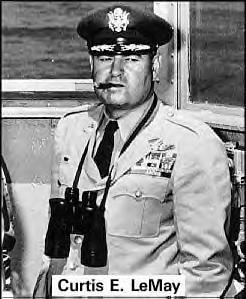 LeMay was SAC commander until June 1957. LeMay was appointed Vice Chief of Staff of the United States Air Force in 1957 and Chief of Staff in 1961. 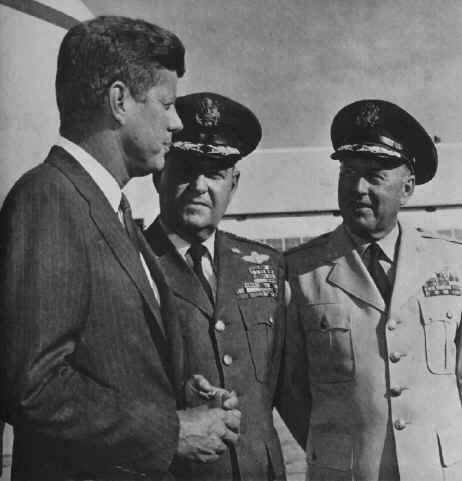 As a member of the Joint Chiefs during the Cuban Missile Crisis, LeMay recommended that President John F. Kennedy send the navy and SAC to surround Cuba and if need be, "fry it." When the crisis ended peacefully, LeMay called it "the greatest defeat in our history." John Kennedy and his key people were determined to seize control of the military -- a feat no president had accomplished since World War II. The chiefs resented the Kennedys and their whiz kids who had little or no experience in military command; the chiefs were accustomed to presidents who let them do their thing without meddlesome interference from politicians. Perhaps the two most dangerous of all the generals were Curtis LeMay and his head of the Strategic Air Command, General Thomas Power. General LeMay is legendary for his mania to start World War III by goading the Soviet Union with unauthorized reconnaissance flights that penetrated their forbidden boundaries. 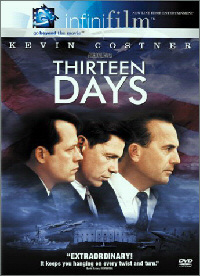 Meetings of the Joint Chiefs of Staff were alluded to by some as a three-ring circus. General Curtis E. LeMay, Air Force chief of staff, was characterized by one observer as always injecting himself into situations "like a rogue elephant barging out of a forest." There are many stories of LeMay's crudeness in dealing with his colleagues on the Joint Chiefs of Staff. He found the meetings dull, tiring, and unproductive. Petulant and often childish when he didn't get his way, LeMay would light a cigar and blow smoke in the direction of anyone challenging his position. To show utter disgust, he would walk into the private Joint Chiefs of Staff toilet, leave the door open, urinate of break wind loudly, and flush the commode a number of aggravating times. He would then saunter calmly back into the meeting pretending that nothing had happened. When angry with individual staff members, he would resort to sarcasm; if that failed, he would direct his wrath to the entire staff. LeMay was in policy conflicts with the Joint Chiefs. He battled with Admiral Arleigh Burke over the control of the nuclear Polaris submarines. LeMay wanted them under his command and actually achieved some control in the Pacific theater. But Burke successfully fought the Air Force every way he knew -- in the Joint Chiefs of Staff, in Congress, and in the press -- any way to prevent LeMay's power grab. LeMay apparently had grown immune to the horror of killing. He had directed the gasoline-jelled fire bombing of Japan -- estimated to have killed "more persons in a six-hour period than at any time in the history of man." He said of war: "You've got to kill people, and when you've killed enough they stop fighting." He once said, "We killed off -- what -- twenty percent of the population of North Korea." More than two million civilians died in LeMay's campaign from napalm bombing and destruction of massive dams to flood waterways. LeMay was a ringleader in the Joint Chiefs of Staff insofar as urging Kennedy to go to war in the Bay of Pigs and later in the Cuban missile crisis. Kennedy wisely resisted the Joint Chiefs' recommendations. LeMay was the foremost proponent of the nuclear first strike, saying that we should give the Russians the "Sunday punch" before they did it to us. In the 1950's, under Eisenhower, LeMay had the authority to order a nuclear strike without presidential authorization if the president could not be contacted. That option was extended down to General Thomas Power, head of SAC, whom LeMay himself described as "not stable" and a "sadist." LeMay's proposal for a nuclear first strike and massive destruction of the Soviets was thwarted by Eisenhower, whom LeMay came to consider as indecisive. 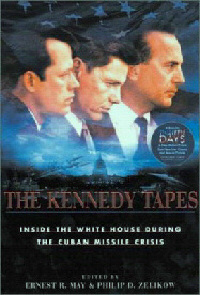 He was even more disgusted with Kennedy, whom LeMay believed to be a coward. LeMay talked openly about a preemptive attack in which one hundred million people would be killed. If ever there were a mad, rogue general who would lead a coup, it would appear to have been General Curtis LeMay. After LeMay retired from the Air Force, he teamed with segregationist governor George Wallace in an unsuccessful candidacy for the vice presidency. In the years following LeMay's failed political race, he became somewhat of a recluse, seldom leaving his home. LeMay died in 1990. Did a Neocon Gang Send Anthrax Letters to Senators Daschle and Leahy to Intimidate Them and Thwart a Congressional Investigation of 9/11? George H. W. Bush -- Was He Part of It? Did Militarists Sabotage Gary Power's U-2 Plane? Who Killed JFK? 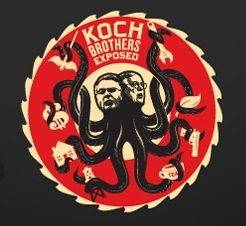 The evidence points to a right-wing faction of the CIA with some help from its friends. In CIA lingo, friends are referred to as "assets." CIA assets, including media assets, were employed to help cover-up the crime. This CIA faction was angry at JFK for his refusal to commit to a full-scale invasion of Cuba at the Bay of Pigs, and for his efforts to seek an accommodation with the Soviet Union and Fidel Castro. High-level CIA officers are implicated. 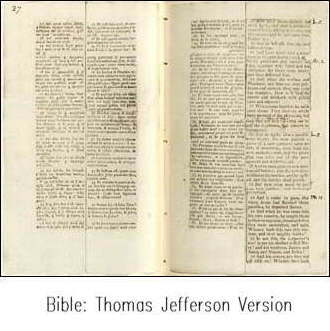 They include: Richard Helms, James Angleton, David Phillips, E. Howard Hunt, Theodore Shackley, William Harvey, David Morales, Edward Lansdale, and George Joannides. Typing any of these CIA officer's names into an Internet search engine, along with the words "JFK assassination," will uncover a network of conspirators.